Medical and recreational marijuana has been on the rise in the past few years. Ever since cannabis was legalized in some states and countries the industry has experienced a boom in business. In today’s market, there are lots of products and tools related to cannabis use. These include growing boxes, lights, inline fans, and weed grinders. In this piece, however, we concentrate our efforts on weed grinders. Weed grinders are designed to grind marijuana into small and fine bits. This makes it easier to smoke and cook the weed. Grinding allows for a more predictable flavor and manageable smoking. We should also point out that it is close to impossible to vape or even smoke marijuana in its natural form. Well, natural marijuana is the size of small nuggets. This is actually where the name ‘nugs’ comes from. With the booming business in the industry, there is an increase in the supply of weed grinders. And while this is a great thing, it makes it difficult for newbies and even some pros in the weed industry to make a decision of the best electric weed grinder to buy. The very first question individuals ask themselves is which is better, manual or electric weed grinders? In this piece, we endeavor to answer this question and provide even more on the same. 1 Electric Weed Grinders – What is it? 4 Conclusion: Which Electric Grinder? 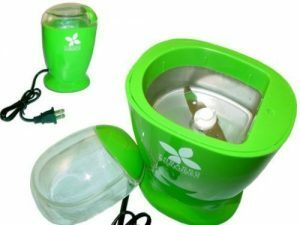 Electric Weed Grinders – What is it? Electric herb grinders are designed to shred marijuana. They are made with a compartment in which the herbs are placed in their full and natural form and size. You should note that the size of these compartments varies from one grinder to another. However, irrespective of the variance, the units can fit in the pocket easily and with discreteness. The size of the compartment, needless to say, determines the amount of herb you can grind at a go. There are other factors affecting the amount of ground herb produced but this is at the top of the list. The chamber sports some sharp metallic discs that are designed to grind and slice the bud. These are connected to a battery. You twist the compartment into a battery designed for the device, press down on a start button, sit back and watch the magic take place. They not only provide you with even consistency with your herb but also allow you the chance to choose the consistency level of your ground herb all by pressing a button. If you like your herb course you just grind it for a short time, if you want it more powdery press and hold the button for a full 15 seconds. It is that easy! With large pieces, like those you get when you are using a manual grinder, are perfect for use with a bong, pipe or a bubbler. If you are into vapes, you will need a finer consistency. This allows for you to vaporize the product without wasting any of the herbs. Adding to this if you plan to cook marijuana, you will need to have fine ground herb. Preferably in powder form. With a manual grinder, trying to get your weed to a fine consistency is a daunting process and takes a long time. As a matter of fact, for most people, it is impossible. But with electric grinders, you get your ground herb with the desired coarseness in a timely fashion and with minimal effort. Seriously, all you have to do is press the button. There are some electric herb grinders that come with storage. Just fill up the compartment, and screw the lid on. Before you grind the weed, you should ensure that it is fresh. Manual herb grinders require you to twist and grind the herb with your bare hands. The process is tiresome and takes a toll on the finger joints and wrist. With electric herb grinders, on the other hand, you do not run the risk of injury. You, after all, do not repetitively twist and grind the herb. For anyone with arthritis or any other condition affecting hand mobility, this comes as great news. Also, needless to say, the electric herb grinder saves you a great deal of time you are better off spending on other activities like enjoying your ground herb. On the flip side, unlike manual herb grinders, electric herb grinders come with the added expense of replacing batteries every so often. There are those that like computers, tablets, phones, and books are rechargeable. All in all, the pros of electric weed grinders are more compared to their cons. But for some reason, some individuals still prefer manual herb grinders to electric grinders despite their obvious advantages. And now that we have all that out of the way, let’s get into reviewing some of the best electric weed grinders in the market today. We have taken some time to use these products and compile the reviews. As such the reviews are dependable and are by far the best electric grinder for weed available in the market. The name reads tobacco grinder. But we all know what tobacco in most cases stands for right? Honestly, how many times have you walked into a cannabis shop and felt the need to disguise what you are there for? Using a word that does not necessarily insinuate marijuana? Many times we are sure. This tobacco shredder by HBI in that light is a great weed grinder. The herb grinder comes with a capacity of 1.75 oz. With this capacity, you get to grind up a fluffy bud like it is your last time to. The herb grinder is electrically powered and comes with a plug. It works fast and like many electric herb shredders, it is easy to use. This electric grinder features a unique design and most do not even come with a keif catcher. But this is not a deal breaker. It makes up for this by accumulating keif on the lip and the lid. You should also note that the fact that it comes without a keif catcher also means that it does not sport a keif scraper. But you can also purchase a keif catcher separately. The Electric Tobacco Shredder By HBI is safe and secure. As a matter of fact, the unit will not start without the lid being shut. All in all, this electric weed grinder is phenomenal and a perfect choice. Cuisinart is a household name. It has over the years built a name for itself as one of the most reliable kitchen item brand in the world. The brand makes everything from pans, pots, snow cone makers, toaster ovens and more. Anything you can think of, Cuisinart can make and probably already has made. 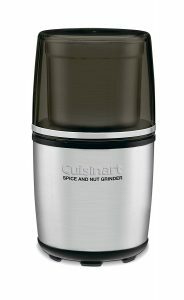 That said, this electric spice and nut grinder they have in the market acts as a perfect electric weed grinder as well. Sure they brand it as a spice and nut grinder, but it serves as a great weed grinder. This herb grinder is made using durable stainless steel blades. The blades are strong and do not rust. Adding to this, the grinder is packed with a heavy-duty motor. To start the grinder, you push down on the top lid. The bowl has a capacity of 90 grams and more to this, the lid provides extra storage space. Placed on a smooth surface, the unit does not slip. This is courtesy of the rubber feet at the bottom. Last but not least, the lid and the bowl of this herb grinder are dishwasher safe. There is just something satisfying about this stainless steel grinder. It is sleek and has a super smooth feel and vibe to it. If you already have a kitchen that is full of stainless steel items, you will just be matching the unit to the rest of your items. It is beautiful and is a perfect addition to your cannabis accessory collection. The Avryware Stainless Steel and Spice Grinder sports an ergonomic design that feels really comfortable to touch and handle. The unit can be operated with one hand. 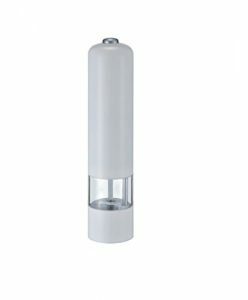 It is small size make it highly portable and discrete. But its best feature is the fact that the item does not require a cord or batteries to operate. As such, you do not have to find a power source every time you need to grind your weed. A cool feature is also that this grinder is multi-purpose. If you wish, you can have the unit serve as a pepper and salt grinder as well. But honestly, you will want this grinder to break down your bud – it is very efficient. If you need to grind weed in large amounts, whether it is for sale or just storage, then this commercial weed grinder is perfect for you. 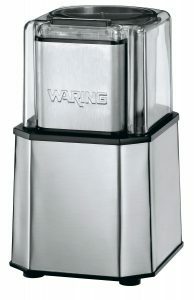 With the Waring Commercial WSG30 Electric Spice Grinder, you are bound to amass lots of ground weed in a very short time. This electric weed grinder has been designed with both looks and functionality in mind. The herb grinder is made from durable stainless steel. This gives its strength and ability to withstand constant use and wear and tear. Adding to this, the herb grinder is designed with a safety lid which ensures that the unit will not start before the lid is closed. This safety is imperative given that the motor rotates the blades at 19,000 rpm. The beauty of owning this weed grinder is the fact that it sports a variety of settings to choose from. You can set the electric grinder to your preferred setting and get ground weed down to your specifications. Needless to say, this unit is worth having. You should note that given its high capabilities and features, you will have to part with a considerable amount of money. Nonetheless, it still will provide you with value for your money. We have looked at stainless steel electric weed grinders that are huge. There are however some that are inconspicuous. Some are far more camouflaged than most. These can pass for basic grinders. You can leave it lying on a table and visitors will not take notice of it as a weed grinder. 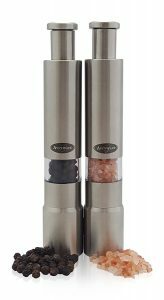 This iRSE Electric Stainless Steel Salt and Pepper Grinder is one of the most inconspicuous grinders available on the market. This weed grinder comes in a variety of colors. You can choose from four colors available. As such, you are not limited to a single look and finish. This unit is battery powered and as such you will not have to deal with annoying cords. While the herb grinder does not feature the 4 AA-size batteries it needs to operate, they are readily available. Compared to other electric weed grinders, this unit comes with a ceramic blade instead of a metallic blade. It grinds the herb coarsely and finely depending on your preference. Overall, the unit is easy to use and comes with varying chopping speeds. It is also inexpensive and affordable. Let’s start with the manual weed grinders. These are made from different materials which include wood, plastic, and metal. Different types feature different compartments ranging from 2-4 chambers. Of all these herb grinder types, the 2-piece grinders are the most popular and most basic. In the 2-piece grinders, you basically put the herb to be ground and comes right out of the bottom side. Adding a 3rd piece to the herb grinder makes things slightly more interesting. 3-piece herb grinders feature a screen mesh which acts as a mesh collecting compartment for the fine herb pieces you grind. These fine herbs are known as keif. The 4th piece is a lid for the grinder’s top chamber. This acts as storage for the weed. The different types of materials used to make the herb grinders result in different quality. For instance, plastic grinders are affordable. They probably are the cheapest. They also can last long provided you take great care of them. But even with utmost care, the teeth used to grind the herb are prone to breakage compared to the metal grinders which feature stronger teeth. That said; let’s get into electric herb grinders which are the new haze. Electric herb grinders have the same objective as the manual grinders, only without the additional grinding labor. Their ease of use is the reason why they have gained so much popularity in a very short time. The electric herb grinders are designed with a compartment in which you place the weed and another which contains the batteries and blades. Now, grinders, either manual or electric, the ultimate difference boils down to the results you want and the convenience of the grinding process. A good herb crusher should save you money, effort and time. So whichever fits the bill for you, go for it. Clearly, there are numerous varieties of electric grinders to meet your herb grinding needs. These come at varying price points and with varying capabilities. Depending on the consistency and coarseness you are looking for, you now are in a position to choose the best electric grinder for you. As we started by pointing out, we have tried and tested these herb grinders. The recommendations we give are dependable and can be trusted. We believe in choosing quality products by using the price points as the sole determinant of the herb grinder to use. However, to enjoy the best performance, as you might have seen in the list above, you will have to spend a considerable amount of cash.